Firewood Racks help keep firewood clean and organized. 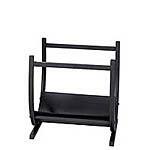 Firewood racks come in different sizes depending on your needs and covers are also available. We even have a stylish curved rack for customers want a little more style. 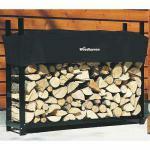 Heavy-Duty-Firewood-Racks are built extra strong for storing large amounts of firewood. They come in sizes ranging from 3 feet to 16 feet and covers are also available. 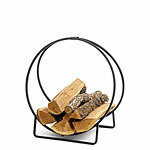 Log Hoops are another type of log holder that can add both function and interest when storing wood. They are also great for smaller spaces. 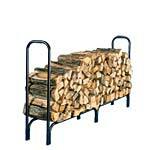 Firewood Carts are another fireplace accessory that can make moving firewood easier and faster. 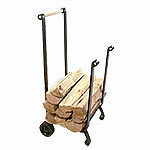 We carry firewood carts that we think are the best value on the market and we guarantee our price. Small-Hearth-Log-Racks are great for storing several logs on the hearth and can make adding wood to the fire easier. 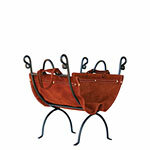 These hearth racks come in many different styles and sizes. Large-Hearth-Log-Racks are designed to hold large amounts of wood next to the hearth and will make a real visual statement. 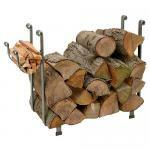 We carry these large firewood racks in many different styles and sizes. Wood-Holders-with-Carriers combine a carrier for bringing in wood from the storage area and a holder to place the carrier in. 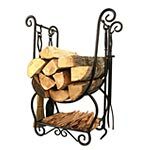 These firewood holders come in many different styles and colors and all have a best price satisfaction guarantee and are a must fireplace accessory Wood-Holders-with-Fireplace-Tools combine a wood holder and fireplace tools all in one neat setting on the hearth. They come in many different styles and are also a great value. 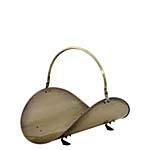 Firewood Baskets are a simple yet effective way to move and store firewood. They come in beautiful black and antique brass finishes. 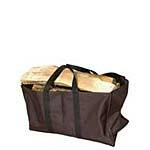 Firewood Log Carriers are another way to make carrying wood easier and are a great value. These are great for people who like to keep things simple. Customer Satisfaction Guaranteed Any firewood holder purchased from ChimneyDirect.com will withstand many years of use and will have high quality construction. ChimneyDirect customers always enjoy the added confidence of knowing that our 30-day money back guarantee demonstrates our commitment to complete customer satisfaction. Another advantage of ordering from us is our prompt delivery policy. Most firewood holders are shipped the same day they're ordered and for free if the order is over $ 100.